Princess seamed dress with low shaped "V" neckline and front extension. Front gathers; back zipper. Long set-in sleeves or sleeveless. Regular or floor length. 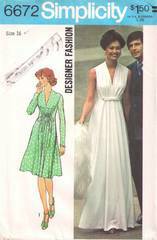 Vintage Simplicity Designer Fashion pattern number 6672.